Rumors and legends abound about treasure dating back to the days of Blackbeard or Captain Kidd! What do these stories share in common? It’s treasure buried deep in the ground which is found only after an arduous search following a complex map. Why can’t treasure hunting be easy? Because, DUH, then the prize would have been found already! 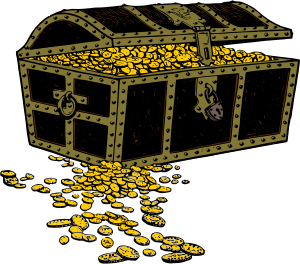 What does treasure have to do with homeschool curriculum? More than you might imagine! As you begin to consider next year’s teaching resources, you need look no further than your mailbox stuffed full of curriculum catalogs, your email or Facebook messages advertising discounts and special offers, or your homeschooling friends who are happy to share what is working well in their family. As you begin to check these resources, you will likely see and hear the same dozen or so names, over and over again. Plus you will also see these same resources in multiple booths in the Exhibit Halls of homeschool conventions and in full-page advertisements in homeschool publications. They are popular and pricey. They are the easily found treasure. But, have you ever tried to find these popular resources used? To do so, you have to continually search the online sites and forums or else you have to arrive extra early at the used curriculum sales because these resources go quickly! In my used curriculum shop, one popular book about a 6 year old boy learning math was snapped up just moments after it was brought in. It never even made it onto my shelves! Even used, these materials will command top-dollar in the resale market. But don’t be discouraged! There is hope for those who get to the party too late to grab the most popular resource or who don’t have the budget to buy the trendiest curriculum with all the bells and whistles. You can look beyond the most sought-after, easy-to-find teaching materials to find a buried curriculum cache! How do you find the map to this treasure? Talk to veteran homeschoolers – especially those five or ten years ahead of you. Ask them what was popular and effective when they were homeschooling the grades you are teaching now. As these moms finish their season of homeschooling, they are ready to unload the boxes and boxes of resources in their closets and garages. And many of them are selling at garage sale prices – only five or ten cents on the dollar. Yet, they find no takers! I know — because after their books fail to sell at their group’s used curriculum sale, the moms end up in my shop, heartbroken. Sadly, they bring in beloved books and materials that hold such fond memories for them. They beg me to find good homes for their resources; they just can’t bear the thought of those particular books ending up in a dumpster somewhere. Do you want more value for your homeschool dollar? Then look for buried curriculum treasure! It may be hiding under a layer of dust in a garage or basement, but its riches are just waiting to be uncovered by another generation of children. Find a veteran homeschooler and follow her lead to an unrecognized treasure trove! This entry was posted in Curriculum and tagged homeschooling, money saving tips, used curriculum on June 9, 2015 by Penny. Dear Penny – Ah! How I smiled as I read your words: “They beg me to find good homes for their resources; they just can’t bear the thought of those particular books ending up in a dumpster somewhere.” That’s me – tons of eclectic homeschool materials collected over the years that need good homes – not the dumpster! What a blessing to discover a bridge to connect “curriculum treasures” with families so that more, in turn, may be blessed!